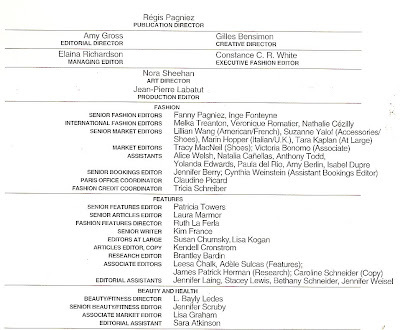 The Elle magazine editorial staff in 1994. My magazines collection includes every issue of Elle beginning with the March 94 issue. Along with Harper's Bazaar and Vogue, Elle is a huge chunk of my core collection. At the bookstore yesterday I noticed I hadn't received the April issue now on newsstands. At home I confirmed I hadn't received the March issue either. My subscription has run out?? I didn't notice? I have gotten that bored with Elle? It's weird because I never imagined ever reaching this point. For ONE split second I worried about the worth of my collection without Elle, and then the thought disappeared. My past issues are all I need, and maybe, the current Elle staff needs to revisit them as well. I want my old Elle back.